Portland Police Chief Danielle Outlaw comes to the Warner Pacific University Library to speak on Justice and Policing. Outlaw believes that humanity can exist in authority. She will explore the ways in which communities and the police can learn to embrace commonalities to build more trusting relationships. Chief Outlaw presents “Justice and Policing” on Monday, October 15 at 1:00 pm in the Otto F. Linn Library on Warner Pacific University’s Mt. Tabor Campus. She will be introduced by Warner Pacific President, Dr. Andrea Cook, and her remarks will be followed by an audience Q & A. The event is free to attend and open to the public, refreshments will be served. After 20 years of service for the Oakland’s Police Department, Police Chief Danielle Outlaw was sworn in as Portland’s 48th Chief of Police early this year. Her vision for the 21st century policing is building bridges. Chief Outlaw is the recipient of the Oakland Black Officers’ Association Trailblazer Award, the Holy Names High School Alumnae Association Citation for Service and the 2015 Police Executive Research Forum (PERF) Gary P. Hayes Award. 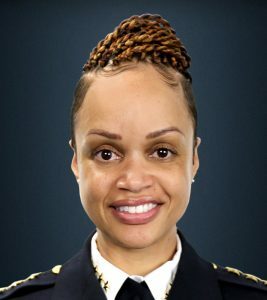 She has served as the Vice President of the San Francisco Bay Area National Organization of Black Law Enforcement Executives (NOBLE) Chapter, and is a member of the International Association of Chiefs of Police (IACP) Human and Civil Rights Committee.